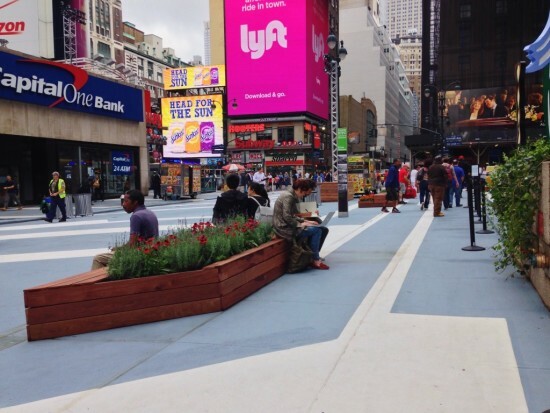 Community Board 5 is experimenting with a temporary pedestrian plaza and sidewalk expansion around Penn Station to manage foot traffic around one of the busiest rail stations in the world. 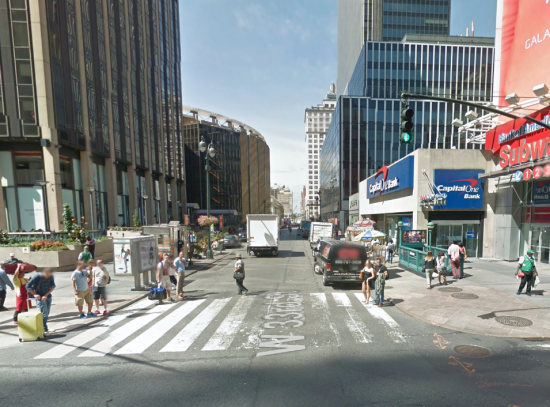 A guiding vision behind these projects is to link Penn Station and Madison Square Garden to the more pleasant Herald Square and Greeley Square area. 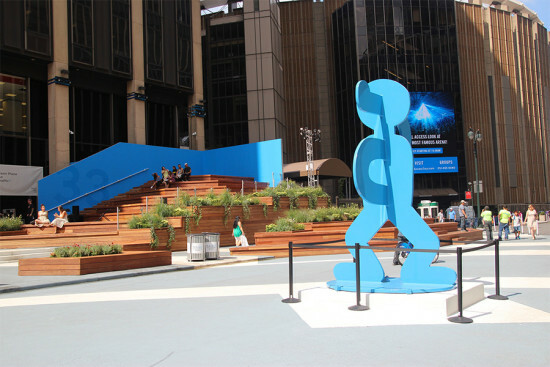 Snøhetta designed the master plan for the area while Brooklyn’s W Architecture & Landscape Architecture, working with Production Glue and in partnership with Vornado Realty Trust, designed Plaza33 on 33rd Street between 7th and 8th avenues. The plaza is intended to create a smoother gradient between the street and the sidewalk to streamline pedestrian flow. The trial period for Plaza33 began July 19th and runs through October 11th. So far, Plaza33 has received positive feedback from Community Board 5’s constituents. Street furniture, including hybrid benches and planters, offers a place for pedestrians to relax and socialize. Public art by Keith Haring and Roy Lichtenstein enlivens the corridor, while community programming, including yoga and film screenings, are planned to activate the space. 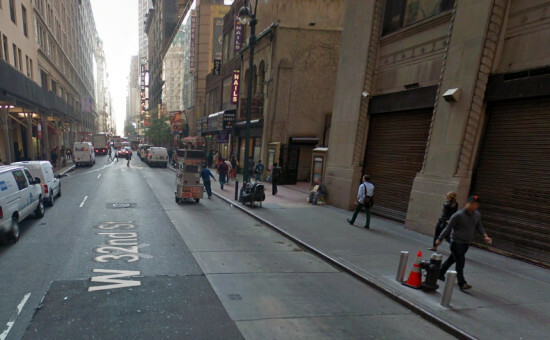 The West 32nd Street sidewalk expansion transforms the space more minimally but is far more controversial. In principle, residential and commercial stakeholders on the target blocks strongly support the plazas. In practice, however, the re-arrangement of space creates conflicts for users. 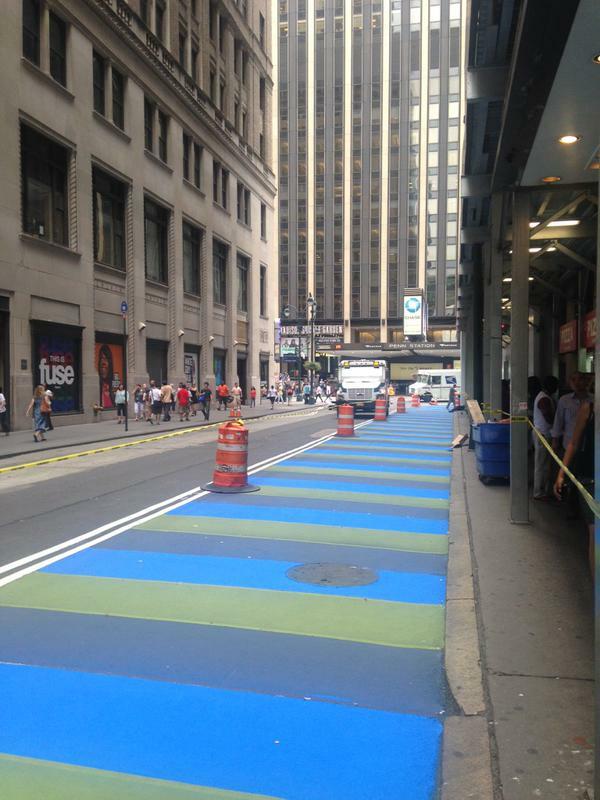 Loading zones on 32nd Street were reduced by 500 feet. Trash collection, boarding for the M4 bus, and services for residential tenants compete for only 180 feet of loading space. Vornado is working with property owners and renters on the block to mitigate the impact of reduced street space. It remains to be seen whether these problems can be resolved to the satisfaction of all (or most) parties before the end of the trial period.